The beginning of fall is the time for garden cleanup. Tomato plants might have a few fruits that could be coddled until temperatures drop into the fifties, but other than that, its time to spruce up the garden and prepare for the next growing season, which can begin as early as mid-October. First, remove any vines or other plants which have stopped producing. Theres no need to continue watering something that is only taking up space. Then, think back to the height of the growing season. Were there any problems that caused horticultural consternation? Gardeners usually deal with pests that posed problems during the spring and summer, whether they were caused by aphids, tobacco horn worms, leaf footed bugs or something else. Perhaps a plant disease like powdery mildew was an issue, or weeds infested the garden. Whatever the issue, a cure, or at least a measure of control, is possible. Many pest control products are available at home stores and nurseries, some of which are organic, but not the majority. People who try to avoid conventional pesticides find their selection is more limited. Fortunately, the answer isnt always to spray or pour something onto a plant. While some garden pests can live in nearby weeds if their preferred victim is unavailable, many will overwinter in the soil, ready to begin their nasty work when spring arrives. Theyre small and hard to reach when buried a couple of inches below the surface. Short of working something into the soil, there are few choices. One method for cleaning up a planting bed is called soil solarization. This actually sterilizes the soil by letting it heat to about 150° for several weeks. The high heat kills weed seeds, insect larvae, even bacterial and fungal disease spores. 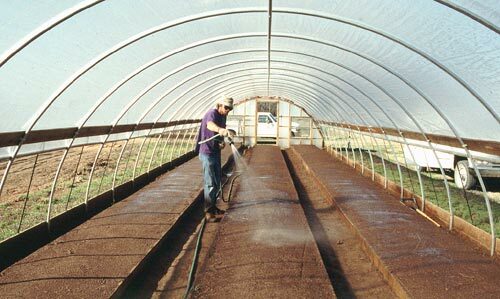 Solarizing the soil requires very little in the way of equipment. It also isnt terribly labor intensive once the initial work is done. The first steps are similar to preparing the garden for planting: moisten the soil and smooth the surface, removing rocks or any other unevenness. Read the full story via Kill pests without pesticides.